Today I will be walking from Chapman’s Pool to just beyond Kimmeridge. You can only walk this section at the weekend, as the path crosses through land owned by the Ministry of Defence, the Lulworth Ranges. I start my walk at Worth Matravers and head down to Hill Bottom. 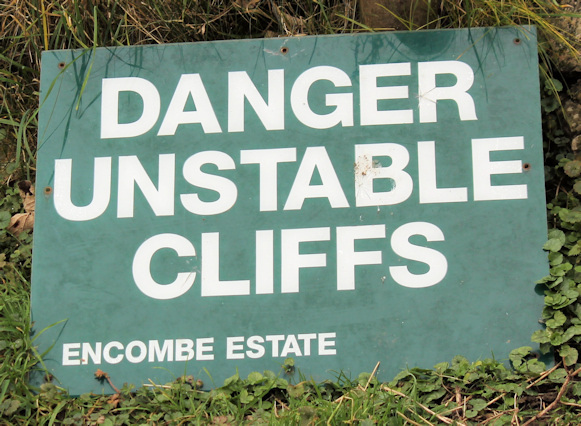 The first thing I see is an ominous sign warning of unstable cliffs. This adds to my sense of unease. The South West Coast Path has an official website containing excellent descriptions of the various stretches of the walk. Frustratingly from my point of view, the website is organised as if you are starting from Minehead and walking in an anti-clockwise direction around the coast; in other words, going the opposite way to my particular trek. 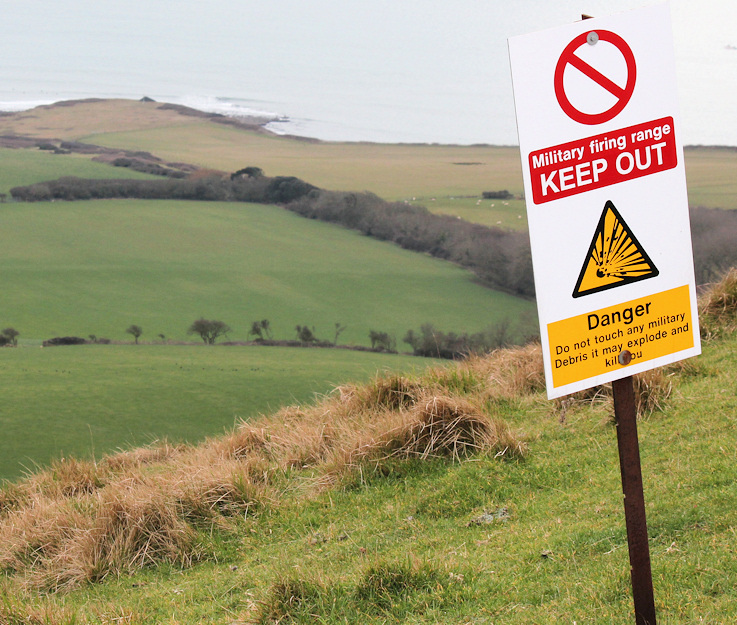 The walk between Lulworth Cove and Worth Matravers is described with the words: “be prepared for some difficult walking right from the beginning. The Path roller-coasters along..” and is graded as challenging. I wonder if I am up to it. But today begins easily enough. 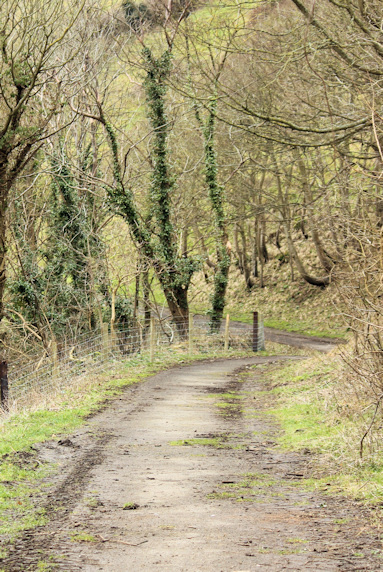 I walk along the little valley, through a wooded area, towards Chapman’s Pool. I am tempted to go down to the beach at Chapman’s Pool – where there are fossils to be found. But I decide to conserve my energy and stick to the planned route. 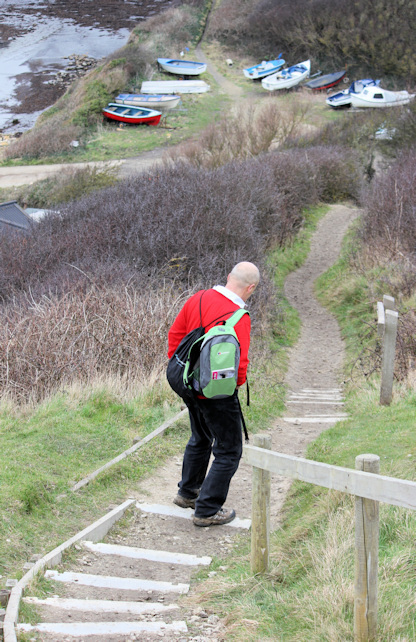 I look for the official coast path and see some steps cut into a steep slope. Is that it? A group of men with a couple of dogs pass me. They head up the steps. Yikes! It looks steep. I make my way upwards, using the technique I used on St Aldhelm’s head yesterday. Twenty steps up and then I can rest for twenty seconds. I am soon out of breath. The steps are high and difficult with my short legs. But I have to use the steps. The slope is too steep to walk up. I wish I had my walking poles with me. This is Houns-Tout Cliff, one of the highest points on the walk and higher than St Aldhelm’s head. The views from the top are spoilt by the dullness of the day, but I do get a wonderful view down into Chapman’s Pool. 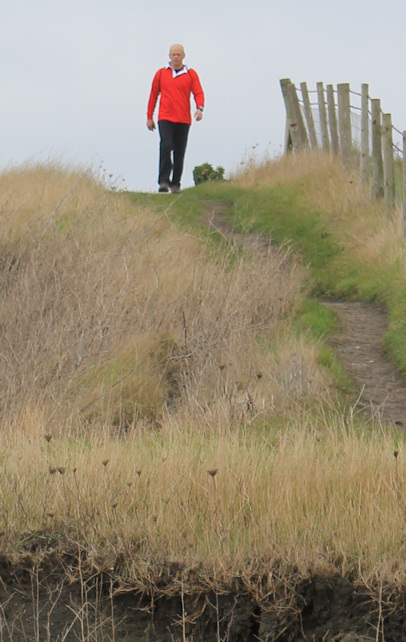 The walk follows the top of the cliff, going up and down with the contours of the hills. I meet a few other people; walkers and runners. The runners wear lycra and look grey-faced. I believe I have done the most difficult bit of the walk (and this turns out to be true), so I relax and begin to enjoy myself. I walk along wide spaces on the top of the cliff, wind down into narrow valleys through trees, and back up to the cliff top again. In places the cliff has slipped and the edge has crumbled into the sea below. There are some great views and I just wish the weather was better. I know my photographs will look dull and not do justice to the scenery. Looking back the way I have come, here is a view of the cliffs showing the layers of rocks and illustrating how the coast has been tilted up into folds over the course of millenia. There is more information about the geology of the area on this detailed web site, by Dr Ian West. Towards the middle of the day, the sun does come out through gaps in the clouds and I manage to catch this photograph of Houns-Tout Cliff and St Aldhelm’s Head beyond, lit up by the rays of the slanting sunlight. As I near Kimmeridge, I meet my husband. He has parked the car at Tyneham and walked along the coast to meet me. It is great to have company for the rest of the walk. My husband gallantly carries my rucksack. He has, as usual, come totally unprepared for a walk and has brought nothing with him. He drinks all my water. Despite the dullness of the day, it is remarkably warm for February. There are rocky ledges lying just off shore – the famous Kimmeridge Ledges – creating some magnificent waves. Surfers are out. I stop and watch, taking photographs on the rare occasions they manage to stand up. As we approach Kimmeridge we see a tower. 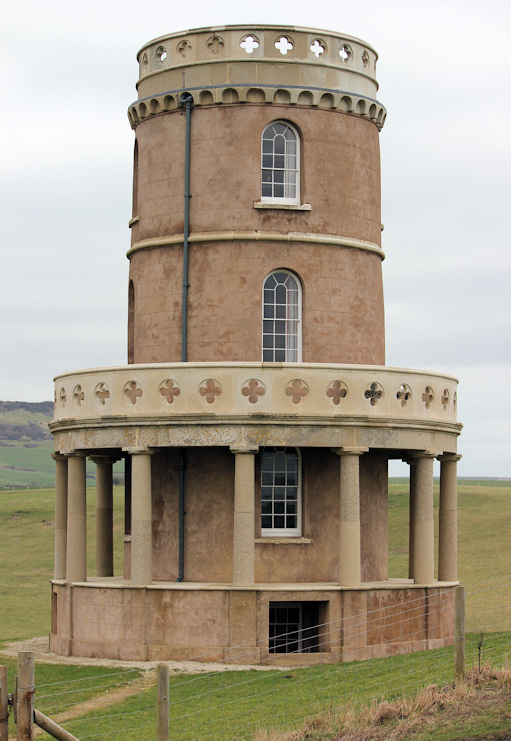 This is the Clavell Tower, a folly built by a rich man in the 1830s. The tower was in danger of falling into the sea, until it was rescued by the Landmark Trust, who moved it – stone by stone – 80 feet inland. This work was completed in 2008 and the tower is available for private hire. You can read more about it on this website. The tower is an amazing construction and stands on a beautiful site. To hire it and stay here for a weekend would be a wonderful experience. The tower has literary connections. Apparently, Thomas Hardy visited the tower and it inspired P D James when she wrote The Black Tower, one of her famous Inspector Dalgliesh novels. Kimmeridge bay is crowded with swimmers and surfers. Families are on the beach. There is a car park and a boat yard and – farther around the bay – even a small oil well. But there is no cafe. 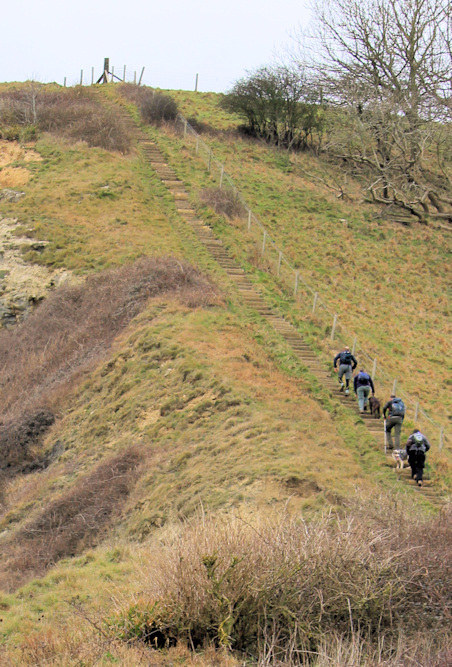 We walk down steep steps to the bay and then follow the road up towards Kimmeridge village. Although I am reluctant to walk inland, away from the shore, we are both hungry. Luckily we find an excellent cafe in the village, run by the farming family who own the B&B in which we are staying. 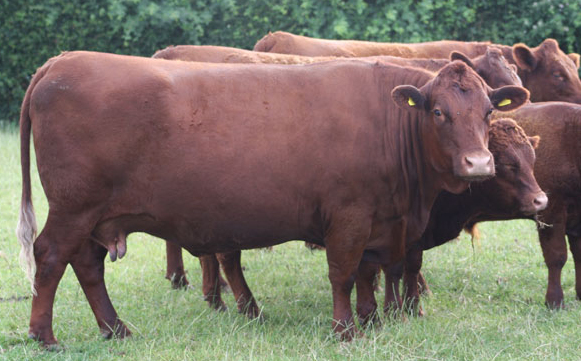 As well as serving food to eat on the premises, the cafe sells their award-winning meat and sausages. After lunch, we walk along a foot path that leads from the village across the hillside. 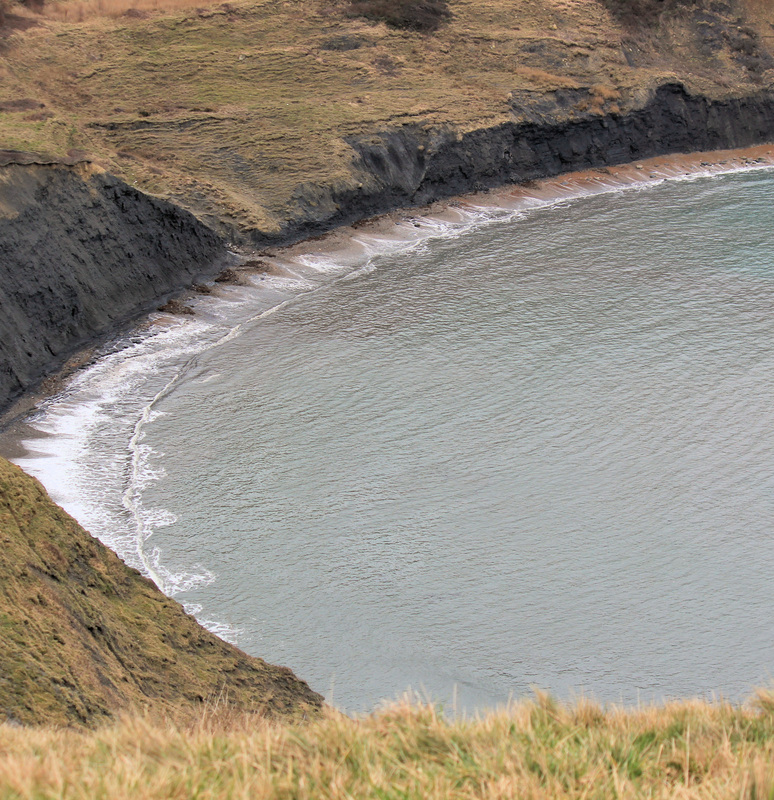 We plan to rejoin the coastal path just to the west of Kimmeridge Bay. The path rises slowly and we don’t realise how high we are climbing until we are on top of the ridge. This gives us truly wonderful views – over Kimmeridge and over the bay and its tower – and beyond, all the way eastwards to Houns-Tout Cliff and St Aldhelm’s Head beyond. If anyone is considering walking along the South West Coast Path, I do recommend this detour – the views are worth it and the climb is gradual and certainly not as steep as the path up from the bay itself. 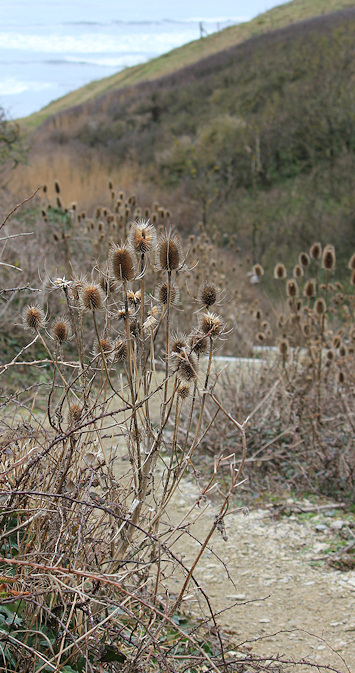 The path crosses into the ‘danger area’ of the Lulworth Ranges and you can only walk here when the ranges are open to the public, which happens on most weekends of the year. I gather the military check that the paths are free of explosives and safe to walk along. The permitted routes are clearly marked. I find a seat and my husband takes photos of me in my ‘favourite’ position – having a rest! We continue along the crest of the ridge, heading towards Worbarrow Tout. Down to the right we can see the ruined, abandoned village of Tyneham and the car park where my husband parked the car. A foot path leads straight down to the car park. I am growing tired and it is tempting just to walk straight down to the car. But I am keen to finish this leg of the walk today. Tomorrow I am planning on walking from Tyneham to Lulworth. Ahead we see the path dips steeply down and then rises up again, to the top of Worbarrow Tout. 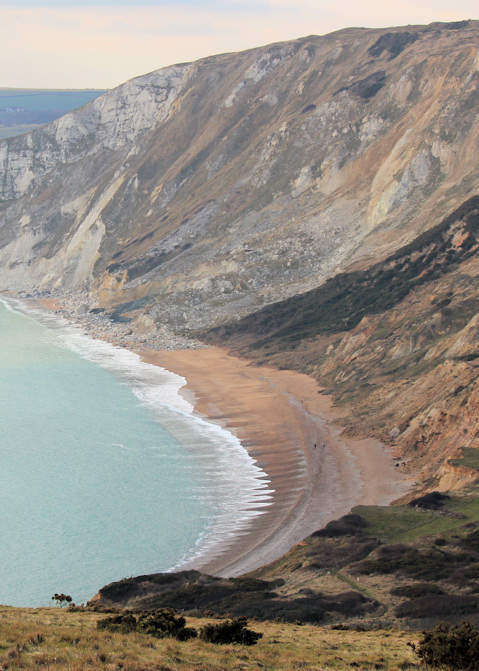 This narrow peninsula of land sticks out and marks the eastern end of Worbarrow Bay. There are some hikers standing on the top, silhouetted against the bright sea. I notice an army firing range number – number 3 – on the side of Worbarrow Tout. I wonder how many rounds of shells have landed on this spit of land over the years. There is a lovely view down into Worbarrow Bay. The afternoon sunlight flits across the cliffs and the colours are warm and mellow. 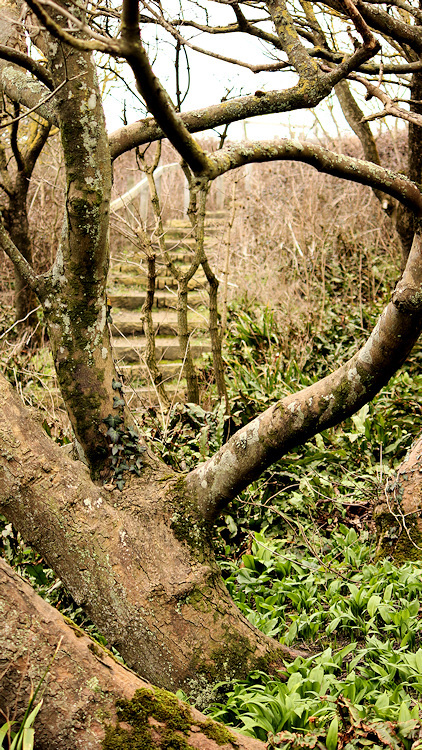 The path down to the beach is steep and we pick our way carefully. I decide I will need a stick for tomorrow’s walk. Having left my walking poles at home, I ask my husband to look out for a suitable piece of wood. As we walk up the track from Worbarrow Bay to Tyneham, we search for sticks. Unfortunately, despite wooded slopes on either side of the path, we are unable to wander off the track due to wire fences and stern signs warning of explosives. Just when we are about to give up, my husband finds a thick stick. It is slightly dirty and rough. But it will do. High point = Houns-Tout cliff, literally, at about 200 metres. Low point = Kimmeridge Bay, literally and even more so when we found there was no cafe. 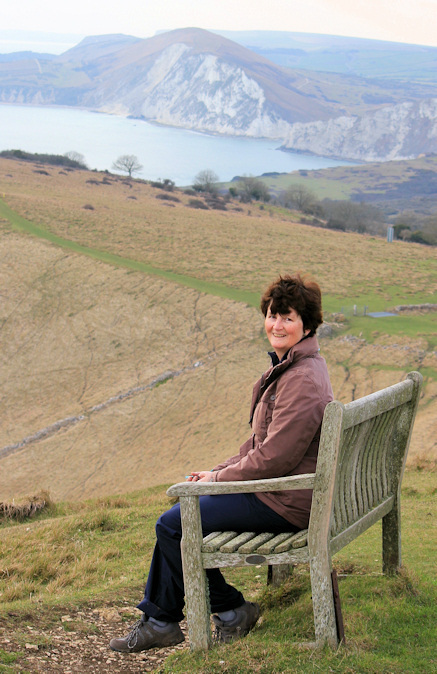 Most beautiful spot = Gad Cliff, walking towards Worbarrow Tout. Well done on completing this walk Anita. It is not only tough physically, but sounds as though the path is becoming dangerous. You were very lucky to be able to visit Clavell Tower!